START YOUR SPIRITUAL CAREER in 2019! giving dream interpretation as spiritual counseling. Get credit for your life experience and current work in spirituality. horizons with new seminary credentials enabling you to offer spiritual counseling and/or teach others. focus, based on your spirituality or religious preference. who come to you for guidance and enrichment. practitioner. The Doctor of Divinity is the most highly respected degree in the U.K. and Europe, outranking even PhD’s. word, ancient scripture, lore, symbols, alphabets, and languages. Th.D. is written at the end of your name. Dr. or Rev. Dr. may be written in front of your name. Rev. Dr. Jane Allen or Dr. Jane Allen. The D.Min. is for working clergy, ministers, missionaries, evangelists, church leaders, who have completed a spiritual or ministerial project then write a thesis based on that project. You must write a 4000 word thesis/dissertation on any spiritual topic that appeals to you. Your paper may be emailed ( seminary@northernway.org ) to us or snail-mailed. Don’t stress over the thesis paper. Just write about something you love and it will flow out of you. Many of our alumni (at least a dozen) have turned their thesis papers into books by simply expanding them into a larger document after graduation. So remind yourself as you’re writing, that you are authoring that book you always wanted to write! We are not accredited by any state agency because we choose not to be. See the Seminary’s FAQ page for the reasons why. Since we grant only religious degrees, the Seminary can remain free of entanglements with government agencies thanks to the religious exemption and the Separation of Church & State. We have legal degree granting authority to confer religious degrees and our alumni are in all 50 states and many countries of the world. The Seminary must continue to meet the requirements for religious exemption. give spiritual training courses where needed, offer transcripts, and keep a real hard-copy file of each and every graduate and clergymember. We can issue transcripts (for a transcript fee and only after you complete certain online courses), offer references and letters of recommendation whenever you need them — for the rest of your life*. We have over 400 spiritual training lessons online which are free to doctoral candidates who pay the one-time tuition fee ($600). You may receive credit for your life and field experience, or take the courses depending on your experience. You receive a legal religious doctorate degree diploma with beautiful gold raised seal, very suitable for framing. The Seminary’s diplomas have been complimented by attorneys and medical doctors who say our diplomas look better than their Juris Doctor or Medical School diplomas. Included at no extra charge is a wallet ID card showing your credential status, and of course our lifetime reference service*. You also become part of our network with all its benefits, such as linking with others, and free listing in our website’s Practitioners Directory. The Internet has brought about vast changes to correspondence schools, which historically were the only “distance learning” institutions available. An unfortunate by-product of the internet revolution has been the appearance of hundreds of phony diploma mills pretending to be schools. They take your money and print you out a worthless piece of paper they call a “diploma”. In the realm of public perception, legitimate schools and religious degree-granting institutions like ours have sometimes been improperly lumped in with the diploma mills. 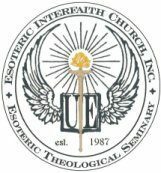 The Esoteric Theological Seminary is unaccredited yes, (because no Christian accrediting agencies approve of our theology, see our FAQ for more about this), but we are exempt from accrediting because we are a bonafide non-profit religious organization with 501c3 status. We are certainly not illegal, nor issuing phony degrees. Furthermore, unlike diploma mills,we offer our graduates and ministers the benefits one normally expects to find in a higher education setting. Many are still very active with the Seminary and serve in such capacities as members of the Board of Directors, Ordaining Council, regional senior ministers, advisors to the staff and faculty, and more. We further offer the networking and connections normally associated with a stone and mortar seminary through our active e-groups and alumni services. We accept PayPal, major credit cards, Money Orders. Payment plans available. Family discount: second degree is half-price. If you have a question, feel free to ask. And be sure to check out our FAQ page to see what others have asked. On CNN, Dr. Lauri the “Dream Interpretation Lady” appeared with Sanjay Gupta. Watch the five minute clip here. Lauri Quinn Loewenberg received her Doctor of Divinity degree from the Esoteric Theological Seminary and later used her minister ordination to perform her sister’s wedding in Tennessee. Dr. Lauri has made several TV appearances: Dr. Oz, ABC’s The View, CNN with Anderson Cooper 360, The Today Show, and Good Morning America (ABC), pictured right. She hosts a live blogtalk radio show. *Lifetime reference service is available to all our ministers as long as they remain in good standing.